Maxstor compactor filing system makes Maximum Utilization of Space and Store all your Documents More efficiently and systematically. Saving space and time, is saving money. Maxstor mobile filing systems can store files and a host of articles such as box files,flat files, Arch Lever Files, stationery, books, and documents within limited spaces. Maxstor compactor storage helps in proper filing of document which is necessary for an organization to run efficiently. As manufacturer of mobile storage system we can save youralmost half your floor space and increases storage capacity compared to conventional shelving. 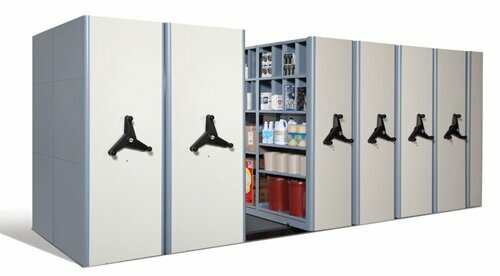 Our mobile filing cabinets require only ONE AISLE, saving your rows and rows of space. If you plan to store more in the future then you just need to add bays. mobile filing systems, mobile filing systems manufacturer, mobile filing systems in India, compactor storage systems, compactor storage systems manufacturer, compactor storage systems manufacturer in India, mobile filing cabinet and mobile filing cabinet manufacturer. Don't waste time looking high and low for old and current files! A simple index system guides you to the file. Lion Compact Mobile Filing Systems can lock your confidential documents from prying hands and eyes. Special protective material seals up gaps to protect stored items from dust. This also helps to keep pests out. Each Mobile Unit rests on welded movable trolleys and mounted on steel ball-bearings.